DMP is putting together a special issue. Calling all Women Entrepreneurs!! DMP will be celebrating women who are entrepreneurs in our April issue of the Literary Digest. We are looking for women who operate their own business in the literary field. Featuring Don Savant, Jennifer Alesia and Divine Creations. Also featuring Literary Career Moves; Publisher and Mentor Dominique L. Watson’s corner of guidance and tips. 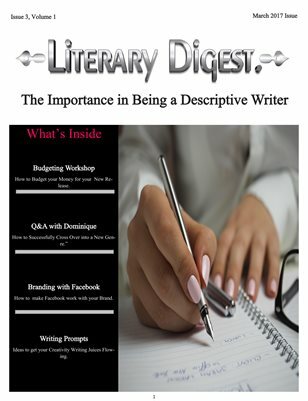 DMP will be releasing it’s March issue of the Literary Digest on March 3rd. We have just a few spaces available for Book Promotion. If you are interested in promoting in this issue, view below what we are offering. Prices start as low as $5. If you are interested in getting featured in this issue, contact DMP today. Spots are available on a first come, first serve bases!! Get Featured in our March 2017 Issue! Authors and Professionals!!!! Get featured in our March 2017 issue. We have several spaces available for new releases, book promos and more! Our prices start as low as $5. Our next issue is coming out March 3rd and we are excited about this issue. If you are looking for a different way to promote yourself, inquire about being featured in our next issue! We promote in our magazine that is digital and in print. We also promote across all of our social media sites. Check out the details and inquire! Download the latest issue of the Literary Digest! Did you get a copy of the latest issue of the Literary Digest? It was released last Friday. 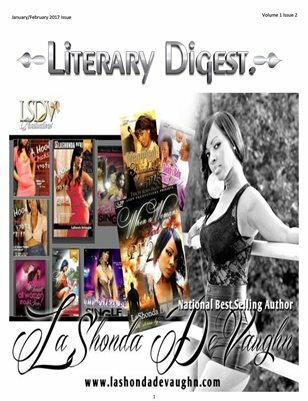 This issue, we are featuring LaShonda Devaughn on the cover. Ashley Robinson, S Raven Storm, John Bowen and Mikkitta Moore are our featured authors. We also have a group of new titles featured in our Literary Digest Book Store. Literary Career Moves has articles and information for all of your literary needs. Download the latest issue today. You can also purchase it in hard copy!